From the great cultural garden of the Midwest, Tyron Woodley calls the neighborhood of Ferguson, Missouri home. Growing up, he was primarily raised by his mother, and it was a daily struggle to survive. To avoid a life of crime, Tyron says he dedicated himself to academic and athletic excellence. He refused to become another victim of the stereotype of his environment. In high school Tyron was awarded for being a two-time All American Wrestler as well as being a permanent fixture on the Honor Roll. He continued on to attend the University of Missouri, where he was the 1st Big 12 Champion in the recorded history of the school and was recognized as a two-time All American. After college, Tyron has continued to have an explosive career in Mix Martial Arts (MMA) with a staggering record. He is well recognized for his dynamic power and devastating knockouts. Most recently Tyron beat Robbie Lawler in the first round of UFC 201 to become the UFC undisputed Welterweight Champion of the world. Outside of MMA and UFC, Tyron Woodley and his wife enjoy a life filled with the excitement of raising their four children together. Woodley is the proud owner of the ATT Evolution MMA and fitness gym located in the energetic suburb of Brentwood, MO. The UFC Champion has created a family oriented environment for people of all skills and disciplines. Woodley is also the founder of a youth mentoring program P5 protocol, which empowers mentors and encourages inner city males. He’s had several television and film roles, appearing in Olympus is Falling, Agent of Shields, Sons of Anarchy, Player, and the box office hit film Straight Outta Compton. 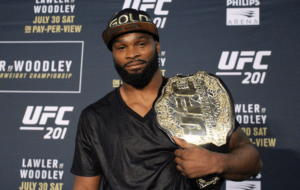 Tyron Woodley is highly sought after and top keynote speaker from the UFC. Use button above to book Tyron Woodley as your next Keynote Speaker.